The Dyson 360 Eye was designed from the start to NOT be your typical robot vacuum cleaner. Just like their larger models the Eye was built on the premise that more suction power is always better. In fact, their testing showed that it had twice the suction as the other top robotic vacuums sold today when picking up dust on multiple floor types. While this might not be something you would expect from a robot it is important because you want it to be effective during use as it typically won’t be making multiple passes over the same areas unless programmed to. The Dyson engineers wanted it to be much more efficient than other similar priced brands. 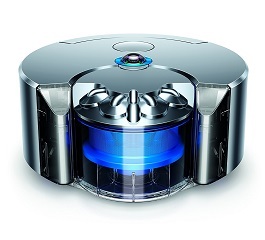 It’s hard to believe but Dyson engineers actually started working on the designs for a robot cleaner in 1999. They wanted to build a machine that cleaned properly on a regular schedule with no intervention on the owner’s part. It’s pretty obvious that this is no simple feat so they put time into the effort over the years, incorporating the improvements found on their more popular vacuums into what would eventually become the Eye. Just under 300 different validation tests were run to make sure it not only picked up dirt on many different surfaces but also that it would hold up under many years of typical use. It may have taken 17 years to hit the market, but in 2016 the first Dyson robotic vacuum rolled off the assembly line. Click here for more features and current online pricing! Another unique feature of the 360 Eye is the continuous tank tracks underneath the body. These are placed there instead of standard wheels to provide excellent traction across all surfaces including thicker carpets. Plus they improve stability to keep the machine upright should it encounter an unexpected obstacle along the way. Probably my favorite feature of this new Dyson is their Link App. You can install it right on your smart phone, giving you an intuitive interface to link up with the Eye. See when your robot vacuum is cleaning, how much progress it has made, and even view a map showing where it has been in your home. Watch training videos and view maintenance information right at your fingertips. Set the schedule with a few quick swipes in the application and it will be off and running. You don’t even need to be at home to see exactly what it is doing. 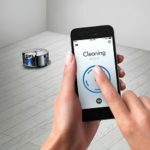 This really turns it into a ‘smart’ vacuum cleaner that can be controlled by you no matter where you are currently located. A quality filter is very important for removing microscopic allergens like dust mites, pet dander, and pollen from the air as it passes through. Most small robot vacuums do not have much in the way of filtration as there just isn’t enough onboard room to fit a filter in. The 360 Eye is a little different in that they include their standard ‘advanced’ filtration that removes small particles, making the indoor environment healthier for you and your family. This Dyson is slightly taller to accommodate a filter as well as a decent sized dirt collection bin. Charging is accomplished via the included docking station that can be setup in a place that is out of the way of foot traffic. The Eye will make its’ way back to the dock in the most direct path so it can quickly recharge when needed. It also sits in the dock when not in use so it is ready for a full cleaning pass when the schedule next comes up. The running time is between 40 and 75 minutes depending on which mode you selected. Max Mode provides the most powerful suction and overall best cleaning while the Quiet Mode dials the power back for lighter cleaning. It also gives off 35% less noise while allowing the battery to run for approximately 75 minutes. This is an ideal setting for strictly smooth floors or quick passes in between the full cleaning cycles. Many homeowners love the convenience of a robotic vacuum as they can simply set it to clean on a regular schedule. It’s a great supplement to the weekly full house cleaning that a large upright or canister cleaner is built for. The Dyson Eye 360 performs surprisingly well for a small machine as it has a lot of suction and advanced filtration for removing virtually all allergens that it encounters. For a lot of homes it is all that is needed to keep the floors clean, eliminating the need to spend time at night or on weekends running a larger vacuum. It represents a big step forward in this industry. For more information including online customer reviews and current pricing, click here to visit our recommended supplier.